There are teacher-y things we’ve all said to our students that we wish we hadn’t. Am I right? Ask three before me*. Sound it out. You freaking brats are driving me crazy. Wait, scratch that last one (who would SAY that to children? Certainly not ME). The following teacher go-tos are especially prevalent in language arts classes, and, as a public service, I am hereby declaring them to be Three Teacher-isms that all of you literacy teachers out there Stop Using Now. Not in August, when you can “start over” with a fresh batch of students. NOW. Here they are. …[T]here were the angels, the dozen or so Winslow cherubim: pouring, toe-dipping, squatting at the edge of the water. The youngest were naked, the oldest in bathing suits, the five- and six-year-olds in water wings or life preservers so their mothers could chat one another up, scraping their aluminum chairs along the rocks as they found an even spot to sit. The offspring wore hats atop their sunblock-drenched bodies, and were periodically wrapped in damp towels that invariably ended up dragging, dirty and brown, upon the ground. He was the kind of boy I would have loved in high school—well-mannered, tawny, and lean. The kind of boy who wouldn’t have given me the time of day. He was good-looking in counterpoint to the purebred Winslows; his ancestors, like mine, had probably been workingmen. For a writer, whether you are beginner or one who has been toiling at the craft for decades, looking at real examples and noticing and analyzing the decisions other writers make will be much more fruitful–and satisfying– than attempting to internalize useless directives such as “show, don’t tell” that you are told will make you a “good” writer. Because covers mean something. They matter. 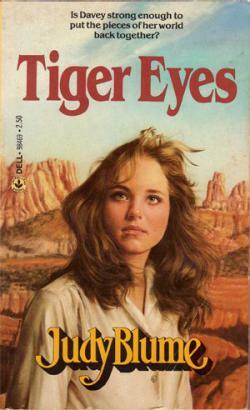 This cover of Tiger Eyes mattered to me because, damn it, that’s how I imagined Davey to be. All pensive and longing and Perma Soft-coiffed. And like it or not, while the mantra “Don’t judge a book by its cover” is fine and dandy when talking about people, the truth is we ALL–students and teachers alike–judge books first and foremost by their covers. While we avid readers know, of course, that what lies underneath that cover may not jive with the first impression we get of a book–in fact, may be infinitely more powerful or compelling than we ever imagined–we also recognize that covers (and first impressions) are important. Allow me to hereby apologize to all students I taught between 2001 and 2007. I was wrong. What happened was, I was so busy teaching full-time, birthing two children, and God knows what else during this time, that I barely wrote myself. Yeah, I wrote at least part of every assignment I gave and dutifully composed notebook entries as my students doodled in their writing journals, but I wasn’t really writing. I wasn’t investing time and energy in any writing that truly mattered to me. As a result, I lost the perspective that I needed to have in order to be an effective “teacher of writing.” I took what I learned at the university, fetishized it, and made cute little posters about “The Writing Process.” I recycled them every June and re-created them every August in brighter colors. And in doing so, I failed you. Because as all writers know, there is no writing process–at least not the one that, coincidentally, can also be found on a gazillion anchor charts on Pinterest. Sure, writers pre write. We draft. We revise. We (sometimes) edit. If we’re lucky, or have been drinking, we share it with an audience. But we don’t necessarily do all of this in that particular order, and certainly not as separate activities (for the most part). So for all those times I forced you to pre write before drafting, for all those times I asked you to show me “evidence” that you took a rough draft and “revised” it, for all that time I took the revered work of Donald Graves and mangled it beyond recognition–I’m sorry. I could blame it on pregnancy brain, but I only have two children. There you have it. I fully intend to add to this list as I continue to learn more about what it means to be an effective teacher of literacy (which means, of course, that I will be adding to this list until I am dead). What have I missed? What teacher-isms do you think we should stop using? Let me know in the comments section below. *For those of you wondering, What the heck’s wrong with “Ask three before me”?, check out Leah Mermelstein’s Self-Directed Writers, published by Heinemann (2013). It’s freaking awesome. Next postWhat in the Sam Hill is a Liebster Award?